For some people, compassion isn’t just a feeling, it’s a lifestyle. 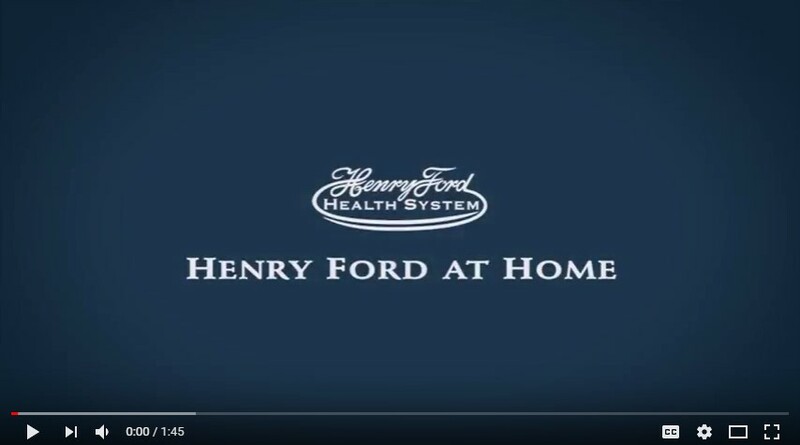 Henry Ford Home Health Care is one of the most prestigious home health care groups in the country, providing compassionate care to our families, friends, and neighbors throughout southeast Michigan in the communities we live and work in. Do you enjoy one-to-one individualized care? Helping patients manage their care at home through interdisciplinary collaboration? Building relationships, teaching and making a difference with patients and their families? Serving your community? If so, Henry Ford Home Health Care may be the career choice for you. At Henry Ford Home Health Care we are proud of our nurses and the quality of care they provide. Our health system thrives on teamwork, and we know our employees achieve the greatest results when they are working together for a common goal - to provide care for our patients. If you enjoy working in a collaborative environment then we have a job for you! Under general supervision of the nursing supervisor, utilizes the knowledge and application of nursing principles to provide direct patient care in the home. Assesses need for other allied health care services such as physical therapy, occupational therapy, nutrition, speech pathology and social work, to ensure an integrated home health care delivery system. Performs other related duties as required. Provides direct patient care to patients in accordance with physicians’ orders. Identifies factors affecting health care by evaluating the patient’s physical, mental, emotional, environmental and social needs with regard to clinical diagnosis and mental condition. Administers medications and treatments as prescribed by a physician and monitors the patient’s response. Set assessment, as required, of patient by obtaining vital signs, wound observation, monitoring lung sounds and reviewing laboratory tests and x-ray studies related to problem or illness. May be required to draw blood and other body fluid specimens for tests and transport to the laboratory. In conjunction with the attending physician, re-evaluates the patient’s outcomes for care, their continued needs, the effectiveness of services rendered and plans for discharge on a regular basis, altering health care plans accordingly. Reports and records significant information and changes, with regard to the patient’s condition, to the physician in charge and maintains accurate and timely clinical records to be included in the patient’s medical records. Responsible for the assignment/supervision of licensed practical nurse and home health aide services provided in the patient’s home. Responsible for increasing the patient’s awareness of medical condition and teaches the prevention of illness and maintenance of general health. Participates in in-service programs, discharge planning and professional committees. Provides counseling to patients and their families in meeting nursing needs. Promotes and ensures Home Health Care's commitment to the Henry Ford Experience. Promotes and ensures Home Health Care's commitment to the HFHS Team Members Standards of Excellence. Maintains a safe work environment and practices personal safety techniques to prevent injury to self and others. Complies with corporate and divisional policies and procedures. Successful completion of a registered nursing program accredited by the National League of Nursing. Minimum of nine months of clinical nursing experience. Ability to effectively communicate with patients, families and hospital personnel. Strong interpersonal and customer service skills required in order to interact effectively with individuals from various cultural and socio-economic backgrounds. Must possess a current State of Michigan driver's license and a satisfactory driving record. Must have reliable transportation and a telephone. Must be able to lift, carry, transport and move clients, if needed.